If any of the top challengers for this year’s World Baseball Classic title have been taking Team Cuba lightly, they would be well advised to start seriously reassessing the picture. The Cubans shocked the professional baseball world back in 2006 when they ran all the ways to the finals of the first Classic – upending MLB star-packed lineups from Venezuela, Puerto Rico and the Dominican Republic along the way. A bit of the luster was taken off the mystique surrounding Cuban baseball three years later (WBC II) when the Red Machine faltered with a pair of tough elimination-pool losses to the Japanese in San Diego. But this time around rookie national team manager Victor Mesa has been touting a single chant – that it is “San Francisco or bust” for the latest Cuban outfit – and there have been many both on the island of Cuba and off who have largely dismissed Mesa’s theme song as mainly idle inspirational chatter. Yet after an impressive comeback final exhibition win here Friday night over the talented Japanese Pacific League Fukuoka Hawks, plus two impressive Pool A outings versus Brazil and China, any doubters or naysayers had better start listening to both Mesa’s words and the hefty Cuban bats that stand behind them. Of course Brazil and China are Brazil and China – not Japan or the Dominicans or the USA big leaguer all-stars. Nonetheless the Cubans have been so far overly impressive on at least three fronts. Foremost they have been playing loose and with a solid air of confidence that can be felt all the way to the grandstands and the press box. 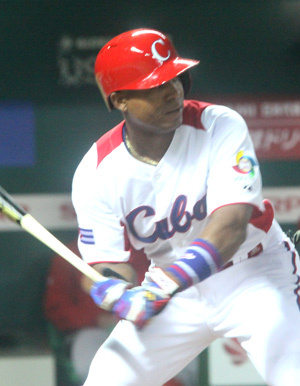 Secondly, the Cuban bats have been booming, erasing many doubts grounded in a number of meltdowns during big tournament and exhibition games (especially against Japan and Holland) across recent seasons. Perhaps most important of all, the somewhat-suspect Cuban pitching arsenal has proven up to the task here in all three Fukuoka Dome outings. Ismel Jiménez and Danny Betancourt have been near brilliant in their tournament starts – a fact to be measured not against the lesser competition offered from Brazilian and Chinese hitters but rather by the pitch location and strike zone mastery displayed during both outings. Racial Iglesias has also been “lights out” in two relief appearances, especially the three closing innings against pesky Brazil on Sunday. And except for one shaky early inning in the Friday night exhibition with the Soft Bank Hawks (a six-run disaster when Odrisamer Despaigne and Darien Nuñez could never find the plate) the collective Cuban mound corps (especially the starters) has consistently been rising to the occasion each and every time the situation has so demanded. Alexei Bell slugs the first homer in Fukuoka WBC action. The Cuban offense jumped out of the box early against inexperienced Chinese hurlers. The explosion began in the first frame after a two-out error on a line drive off the bat of José Fernández that handcuffed first baseman Fujia Chu cracked open the door. Batting right handed against southpaw Chinese starter Xin Li, Freddie Cepeda smashed a ringing triple into the right-center field gap that plated a first tally. After their only scoreless inning of the first five in the second frame, the Cubans picked up the pace in the third when Fernández again opened the action with a single, moved up a base on Li’s wild pitch, and then trotted home thanks to José Abreu’s towering double over the right fielder’s head. Cuba took full command in the fourth when Erisbel Arruebarruena reached second on a wild throw at first, then moved over to third on an almost comical play in which the Chinese attempted to claim that the Cuban shortstop had missed first base; when pitcher Li stepped back on the rubber to but the ball in play and then too casually tossed the ball to first, Arruebarruena simply scampered over the third while the sleeping Chinese defense forget to pay him any notice. Bell’s following home run then made the Chinese pay by upping the score to 4-0. The botch protest play was one of two that exposed the Chinese inexperience. In the second inning shortstop Ray Chang collected the first and only hit off Betancourt and then scampered to second when a passed ball bounced off the glove of Cuban catcher Eriel Sánchez. Reaching the bag safely, Chang (a AAA player in the Cincinnati Reds organization who might have been expected to have more baseball savvy) then left the base and began trotting back to first when two Cuban infielder tactically screamed “foul ball” – caught in the clever deception, Chang was immediately tagged out. The biggest hits of the evening were the pair of homers by Alexei Bell and José Dariel Abreu – the latter a booming grand slam highlighting a six-run fifth-inning explosion – more than enough to put the contest result beyond doubt. Fukuoka’s Yahoo Dome is a difficult home run park: the fences are distant and exceptional high, the WBC tournament ball is soft and dead, and the Dome atmosphere knocks down most fly balls. Press and MLB scouts here had been speculating all week that we might not see a single long ball during the entire Pool A round. But Bell struck first and did so when he was simply trying to elevate the ball in order to assure that base runner Arruebarruena might score from third on a sacrifice fly. Abreu’s bases loaded shot was a truly mammoth blast into the left-center field seats off reliever Yu Liu (Beijing Tiger, Chinese Pro League) that would likely have cleared any fence – even one erected in the Grand Canyon. Not to be overlooked during all the offensive heroics was another solid starting pitching effort, this time by Danny Betancourt. Moving his tosses all over the strike zone and changing his speeds deceptively Betancourt struck out eight, walked only one, and allowed the sole single to Chang. Removed with two down in the fifth by the 65-pitch-count rule, the Santiago ace was followed by Yadier Pedroso (1.1 innings), Vladimr García (0.2), and finally Alex Rodríguez (0.1). Pedroso and Rodríguez yielded the other pair of Chinese hits and Pedroso surrendered the lone additional free pass. Mesa brought Rodríguez to the hill with two out in the final seventh frame in order to give his second closer at least a few tosses and thus keep him fresh for action later in the week. With the score at 12-0, the game was suspended after 6.5 innings by the WBC “knock out” mercy rule in effect for all international tournament play. Victor Mesa repeated a single important message several times during his post-game press conference Monday evening. He was asked on three different occasions by Japanese reporters who his starter would be for the all-important (in the eyes of Japanese media at least) clash with Team Nippon. The Cuban manager responded that for his club the Japan game was not the biggest concern, but rather the greatest importance lay in the pending results of games going on during Pool B in Taichung. Thrice Mesa responded that he did not want to make any pitching plans until he had a better idea who the two clubs coming to Tokyo from Taipei might be – his choice of pitchers would be mostly determined by whether he might have to face Taiwan, or Holland or even Korea on the opening night in the Tokyo Dome on Friday. Thursday’s match here with the Japanese does have an element of pride attached, and it will determine the first seed in Pool A (the team that will play the second seed from Taichung). But the real issue in Mesa’s mind was now to begin maneuvering for round two matches and the final crucial step on the road to his announced goal of “San Francisco or bust” – the new Cuban rallying cry. Great report, Peter, but in Chang’s defense I think the player who was tricked into returning to first was Fujia Chu.